The 4th of January, 2013, was really a day marking beginning a year with blessings for Hanga Abbey. Monks were are happy to have their fellow monk being ordained to deaconate as a step to priesthood. With the need and shortage of priests in the community, this indeed is a very good news to have more monks with capacity of serving the people of God at the level of sacramental administration. We congratulate Frater Ansgar and look forward to his ordination to priesthood. With him there were four other men ordained to deaconate for the archdiocese of Songea. Archbishop Norbert Mtega of the archdiocese ordained the five men. Deacon Frater Ansgar with Archbishop Nortbert Mtega of Songea and Abbot Thadei Mhagama, OSB, after the ordination mass at Songea cathedral. Frater Ansgar (first from left on the front line) with with four other deacons for the Archdiocese of Songea who were ordained during the same ceremony. Further below Frater Ansgar smiling at the photographer Frater Lucius Matembo, OSB. On the right the new deacon at task during mass reading the Gospel. When it comes to the need electricity Hanga Abbey and its institutions understand it quite well. Hanga Abbey have had small hydroelectric power plant which produces about 40kW. This power is not all enough to cater all the needs for power for the abbey, its schools, workshops, and not to mention the villagers. Recently the abbey approached the Manager of electric company at Songea, a nearby town where public electricity is available, for a possibility of supplying the electricity to Hanga a distance of 50 kilometers. The answer was had that for municipalities like Songea, it has a jurisdiction of supplying power within a distance of 30km only. But there is hope because within two years 2013/14 there is a plan of bringing electricity from the National Electric Grid System to Songea. It that happens Hanga will be saved. Hydro turbine at Hanga Abbey. 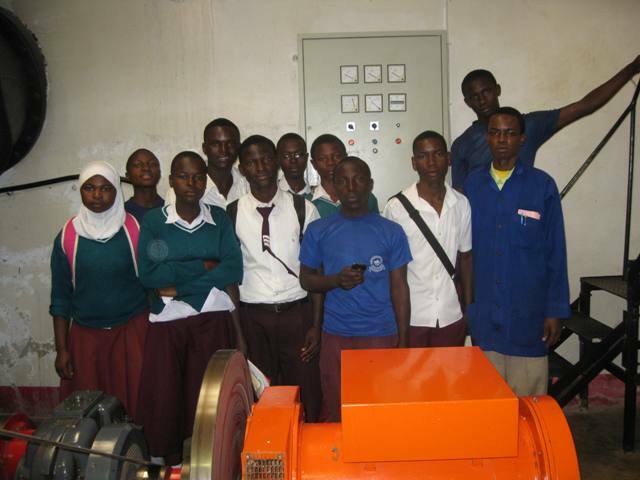 Some nearby students from Songea Girls Secondary students had a tour at the plant in 2011. Due to insufficient supply of electricity individual institutions like St. Benedict, Hanga dispensary and St. Laurent have solar power electricity for lighting.